Alexandria (Arabic: الإسكندرية, al-Iskandariyyah) is the former capital of Egypt (before Cairo eventually took its place). During the period of ancient Egyptian, it was the home of the ruling family, notably Cleopatra, with Julius Caesar guarding the city alongside her. In 47 BC, before Cleopatra's coronation could properly take place, her Staff was stolen by a time-traveling Bowser, preventing her from ruling over Alexandria and the rest of her domain. Later, Mario travels to Alexandria himself after taking the Staff himself, in the hopes of returning it to its rightful owner. As he does not know that the Staff belongs to Cleopatra, he questions various people within Alexandria, including Julius Caesar, one of Cleopatra's guards, and one of Cleopatra's maids. 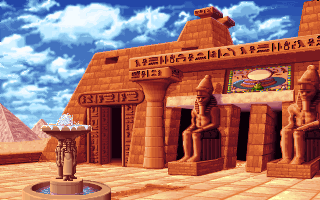 Eventually, Mario is able to confirm the owner of the Staff, and he promptly delivers it to Cleopatra in her chambers, giving her the opportunity to rule. This page was last edited on March 29, 2018, at 19:34.